After some ups and downs yesterday, crude oil managed to wend its way back to positive territory, with prices ending the day 12 cents higher. 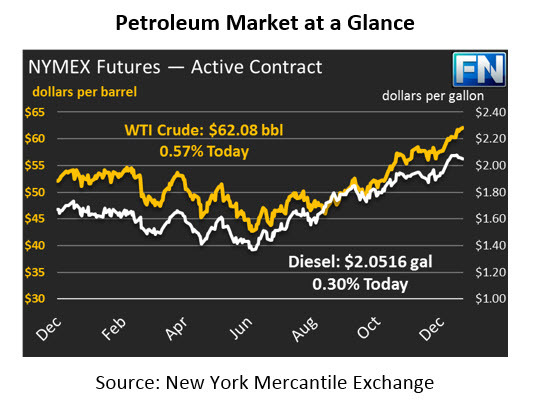 Today, prices are pushing their way higher once again, with prices currently surpassing $62/bbl. Over the past week, prices have peaked above $62 a couple times, but higher ground has yet to stick. Currently, crude prices are trading at $62.08, a gain of 35 cents (0.6%) over yesterday’s closing price. Refined products are also solidly in the green this morning, though they traded in different directions yesterday. Monday saw diesel prices shed 0.7%, or 1.5 cents, as temperatures warm up across the country and heating oil demand falls. On the other hand, managed to stay in the green, ending 0.25 cents higher. This morning, diesel prices 0.6 cents (0.3%) higher, trading at $2.0516. Gasoline is outperforming diesel prices, and is currently at $1.8126, a gain of 1.2%. News for the week has been light. Markets are waiting for the API supply data this afternoon to help provide some direction, as well as the EIA’s monthly Short-Term Energy Outlook later this afternoon. Markets are expecting some impressive numbers for U.S. production to be released this afternoon, given an impressive 9.7 MMbpd of production in November. There’s a growing sentiment that U.S. production has peaked in recent months, and the sentiment received fuel on Friday when Baker Hughes reported a declining rig count. While oil producers have historically invested funds into new wells to grow market share, investors are increasingly looking for profits to flow towards dividends rather than new capital spending. Even if rig counts slow down, though, the overall size of wells has grown. In addition, DUCs, drilled-but-uncompleted wells, have risen in recent months meaning numerous untapped wells are available for production. Even if production doesn’t grow as quickly as it did in 2017, U.S. producers will certainly continue growing in 2018 and beyond.